The year 1972 ushered in Liza Minnelli’s Oscar winning performance in Cabaret, the technology breakthrough of Atari’s “PONG,” and the introduction of Hamburger Mary’s to the SoMa district of San Francisco. The original Hamburger Mary’s was a funky, friendly dive put together on a shoe-string budget. With humble beginnings as an eclectic late-night beer and burger joint, Hamburger Mary’s quickly established itself as a staple in the LGBT community. The mismatched flatware & dishes, kooky artwork and antiques added to the kitsch and charm of the place. It was an “open-air bar and grille for open-minded people” (a motto we still use today), where everyone was welcome. The staff was always friendly and personable, and the food was always fresh and made-to-order. Before long, a second location was opened in Hawaii, then other locations started popping up. Some were opened by the original S.F. owners, while others were granted licensing agreements to use the name. There were even a few “copy cats.” Collectively, this was the beginning of what has become the Hamburger Mary’s franchise system today. Hamburger Mary’s is not a “chain,” but a family of locally-owned independent restaurants. Each franchise location has its own character, because each owner and each city is unique. But no matter which Mary’s you visit, you will experience the charm and openness of the original Hamburger Mary’s. People have come to associate Hamburger Mary’s with friendly service, a mouth-watering menu and an overall flamboyant dining experience. Our “family dining” concept guarantees everyone is welcome at Hamburger Mary’s but our concept is distinctive because we are the only national restaurant brand with a strong history in the LGBT community. Mary believes in the old adage “You are what you eat,” so we serve only the freshest ingredients. And nothing beats a Hamburger Mary’s gourmet burger… always fresh and made-to-order with an assortment of fun toppings on a bakery-fresh bun, including the popular “Buffy the Burger Slayer,” “Queen Mary” and the one-pounder “Proud Mary.” Mary starts with fresh (never frozen!) all-natural beef for her half-pound burgers. But if you’re looking for something lighter or different, most locations also offer turkey burgers, homemade black bean patties, chicken breast and other substitutions. Check out the Mary’s nearest you to find out what’s on the menu. Don’t think that the fun stops at the clever menu items and décor. Oh no, a trip to Hamburger Mary’s is all about the experience. And Mary knows how to entertain! Each location boasts a full service bar with dozens of tantalizing martinis and cocktails, wines and a specialized beer list. While each location is different, most have a patio for the warmer months and offer late-night entertainment such as MaryOke, HamBINGO, weekend DJs, and drag shows. For more information regarding events at a Hamburger Mary’s near you, click on the link to any Hamburger Mary’s location and browse weekly events and specials. We look forward to seeing you! Mary also likes to mix a good time with a good cause. One thing that sets Hamburger Mary’s apart from other restaurants is our fervent commitment to supporting our local communities. From hosting charity bingo events and fundraisers to sponsoring local athletic leagues and theatre troops, each location does its part to give back to its surrounding neighborhood. Over the years, Hamburger Mary’s has helped raise hundreds of thousands of dollars to worthwhile organizations. 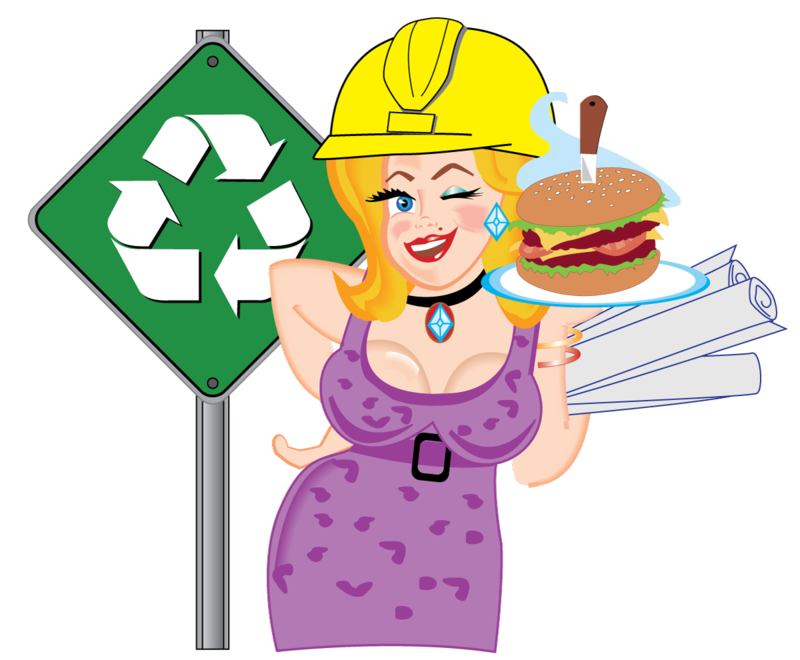 In recent years, Hamburger Mary’s has made strides to be more “green” and reduce our impact on the environment. Switching to recycled paper products, energy-efficient lighting and biodegradable containers are just some of the ways many locations are doing their part. Some locations have fitted their bathrooms with dual-flush handles and top-of-the-line hand dryers, because water conservation and waste reduction is part of Mary’s “Green Initiative.” Some locations have implemented programs for composting and reusing waste. Through all of these efforts, Mary is making every possible effort to reduce the carbon footprint left by her fabulous red stiletto! Eat, Drink, and Be… Mary!